Welcome to week 2 of Rachel and Ryan’s charity challenge! If you’re just joining us, we are raising money in support of Toronto Sick Kids hospital by playing board games every day for five weeks. In addition to raising money and awareness for this great charitable cause there’s pride on the line – we are competing for the O’Sullivan Household Board Game Championship! If you’d like to donate or to learn more about our Extra Life campaign please visit our campaign page here. To start the night off Rachel had me pull up our household gaming stats (yes I keep board gaming stats ;)) so she could make an informed choice. 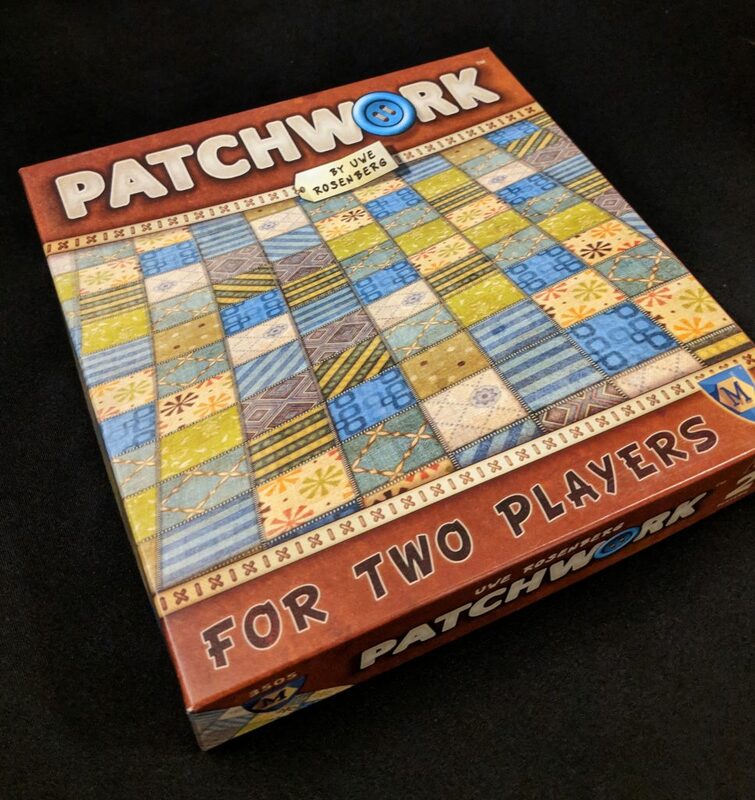 There were quite a few games that Rachel had a >60% win percentage but she decided to go with Patchwork! Patchwork is the game we started last year’s charity challenge off with. An important bit of history though – The only time I’ve ever beaten Rachel in Patchwork was during last year’s charity challenge! Can I pull off another upset? Patchwork is a puzzle game where players use Tetris like shapes to fill in a 9 by 9 grid. There are two currencies in the game: time and buttons. Both of these currencies appear on every piece you buy, buttons are a currency you use to purchase different puzzle pieces and you track time on a board; time is limited so you need to balance pieces between buttons and time, if you go too far on the time track too quickly you won’t buy enough pieces to cover your board, but if you don’t build up a button engine on your board you won’t be able to afford pieces. Every few spaces on the time board you’ll get paid based on the number of buttons you have on your board. It’s a puzzle that’s very fun to play. If you’d like a full overview of the game you can check out this video. 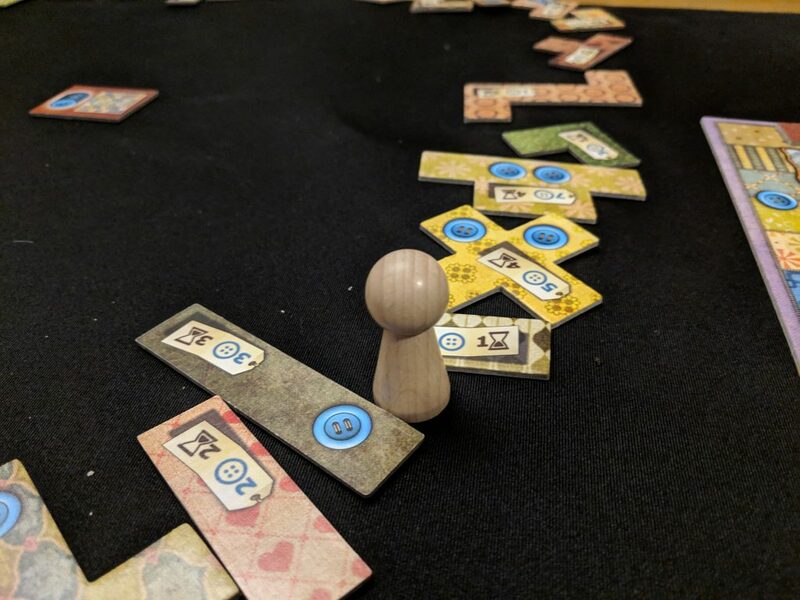 We didn’t look too much into last year’s result from Patchwork before getting started but mid way through we looked up the stats and realized last year I pulled off a big upset, beating Rachel on the first night in the game of her choosing. Why did we check this mid way through? I played like a being possessed. I played Patchwork well last year but tonight I was on fire. 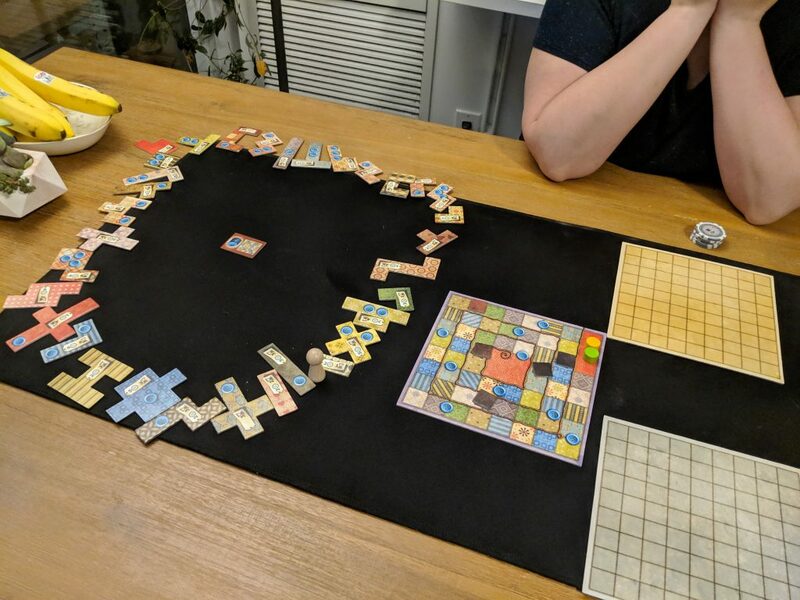 Rachel got really unlucky with her tile selections but I played a very good game. In the end I clocked a personal best 24 to Rachel’s -2. Now a couple points: Rachel’s top score is 49. My previous best score is 19. I have no business beating Rachel at this game. The other point? In our recorded history we’ve played six games of patch work (we played many more before I started recording stats, most of which Rachel won), after tonight we are now 3-3. Those 3 wins? All in the charity challenge. I think Rachel will be a little more hesitant to pick Patchwork in the future. This for sure is a score she will need to settle next year. Week 2 is off to a winning start for me! I plan to do everything I can to win this week and get the competition back level.